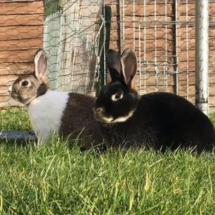 All of our rabbits are neutered before re homing and put into suitable pairs, or can be introduced to another existing pet rabbit. They are social creatures and generally enjoy rabbit company. We have them all vacinated against myxomatosis on arrival. Due to ever increasing vet costs we now have to ask for a minimum of £50 when homing our bunnies, they are costing us much more!! The bunnery is often full to capacity, but currently we are operating a waiting list that is longer than ever. The Rabbit Welfare Association has just updated its figures and reports 67,000 unwanted rabbits entering the welfare system annually (this does not take into account the many rabbits that are just dumped or passed between people) a statistic that has more than doubled in recent years! We regularly receive calls from people who are struggling to cope with rabbits that they no longer want; often this is because they have allowed them to breed and cannot find homes for the youngsters, frequently people find that they cannot provide the care and attention that rabbits require (having mistakenly thought they could just leave the poor creatures in the hutch) and sadly, most often, we take the rabbits that were bought for children who have lost interest in them. We urge everyone who is thinking about buying a rabbit to consider its needs carefully. Under the Animal Welfare Act 2006 owners have a legal responsibility to their pets to ensure their needs are met correctly. 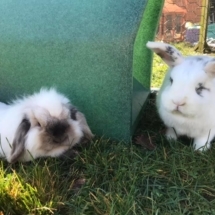 If you want to care for rabbits, please consider a rescue pair from SAR, they will be fully vaccinated and neutered before joining you. Visit www.runaboutruns.com for customer made runs, the kind owner has agreed to make a donation for every order placed quoting “Suffolk Animal Rescue”.